The UAE Cabinet, chaired by HH Sheikh Mohammed bin Rashid Al Maktoum, Vice President, Prime Minister and Ruler of Dubai, has adopted the National Space Strategy 2030 that will see the country making huge investments in ambitious space projects. 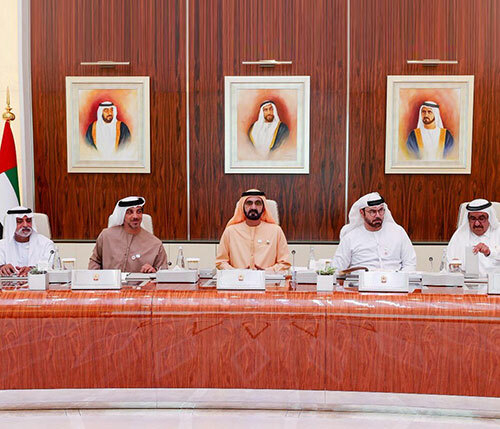 The meeting held at the Presidential Palace in Abu Dhabi was attended by Sheikh Mansour bin Zayed Al Nahyan, Deputy Prime Minister and Minister of Presidential Affairs and other Ministers, Emirates News Agency WAM reported. The National Space Strategy aims at achieving UAE’s vision in the field of space exploration, technologies, and applications. It also constitutes one of the pillars of the regulatory framework for the space sector in the country which consists of four components; National Space Policy, Space Sector Law, Space Regulations, and National Space Strategy. The UAE seeks to establish a major global hub for space science and technology, through investing in building capabilities and creating a scientific, legislative and financing environment that is stimulating and attractive for space projects. During the meeting, Sheikh Mohammed asserted that the UAE had established itself an economic powerhouse and advanced infrastructure by young Emirati talents, which enabled it to be at the forefront of the space exploration industry today. “Last year we celebrated the launch of the first satellite fully built by young Emirati engineers, and in the very near future we will see them operating international space technology centers, based in the UAE. We will see Emirati cadres, highly skilled and specialized in space science, achieving scientific breakthroughs that serve the entire humanity,” Sheikh Mohammed said. We are investing in the space industry, with ambitious projects and initiatives that will benefit our citizens and contribute to key sectors of the national economy. This is an important milestone for our country, and we are aiming to become a model for countries seeking to launch ambitious space programs,” he added. The strategy sets the general framework for UAE's space industry and activities for the next 11 years, including government activities related to space, commercial activities, and scientific activities carried out by public and private sector operators and academic institutions and research and development (R&D) centers. The cabinet stressed the importance of raising awareness about the importance of the space sector among the Emiratis youth, and the importance of enhancing the role of advanced national research and development centers. Today, the UAE possess four specialized centers in Research and Development (R&D) of space, all of them have manufacturing capabilities and where Emiratis represent more than 50 percent of the workforce, with more than half of them women. The Strategy includes 6 objectives, 21 programs and 79 initiatives, which translate into focus areas and programs benefiting more than 85 entities in the UAE. The Emirates Space Agency is responsible for following up the implementation of the strategy in cooperation with strategic partners and more than 20 agencies and space centers abroad.